While developing a Smart RGB headband for 2 guns, we have found that that the problem of the secondary guns is still not solved for the rental clubs. The main problem was that the cost of additional taggers for 2 sets headbands was very big? That’s why using two guns with one headband was too expensive, and in terms of equipment rent it was unprofitable. Therefore, usually only the certain players in each rental club had their own secondary guns. The rental business has its own criteria regarding such guns. Rental laser tag business needs reliability, resistance to high loads, good sound, cool appearance and a small price. Gyrfalcon laser tag pistol has all these advantages. “Gyrfalcon” is the third unique LASERWAR tagger. 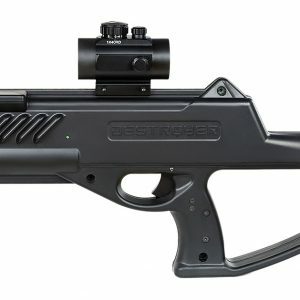 It stands in line with the best rental laser tag guns like Phoenix and Predator and its reliability is unquestionable. As an inspiration, we used the legendary Glock pistol and we decided to take it as a basis for some reasons. Glock in various modifications is used in Germany, Spain, France, Finland, the USA, Belgium, and Great Britain. Ergonomic Glock design perfectly suits the tasks of the laser tag rental club. In club games there is no room for compromise: if you have tarried in the room the enemy will send you to respawn, if you can’t control the number of rounds, you’ll go to medkit on the base. Based on many years of experience, we knew that the rental business needed a gun, the principle of which was ” draw a gun and fire”. And Glock’s device fits perfectly with this principle. “Gyrfalcon” makes a very good impression. There are no weaknesses in the case, the body looks solid, the material is a weapon-grade plastic. The thickness of the sidewalls is 3 mm, the body does not creak, there are no backlashes. The pistol grip completely copies ones from Glock pistol and has cavities for an index finger and a thumb. Due to the transverse lines on the back and front of the body, it lies tightly in the hand. Shooting from the “Gyrfalcon” is very convenient with both right and left hands, and the thickness of the handle is optimal for any palm size. The weight of the game set is 11.1 oz (316 grams). We tried to avoid the running parts in this tagger because any mechanism in the rental business decreases the reliability of the device. Recharge of “Gyrfalcon” is done with the button on the right side of the body. The extreme positions of the button are accompanied by characteristic clicks. Recharging with the button is faster than with the breechblock and it saves seconds in close combat. The bolt carrier of the pistol now has a Picatinny rail and the player can mount any open or closed collimator red-dot sights. 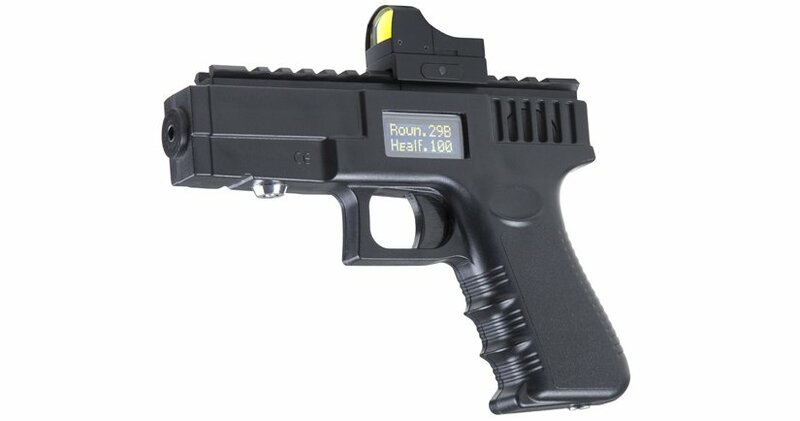 Moreover, this laser tag pistol is already equipped with «Docter» red-dot sight as a standard feature. “Gyrfalcon” confidently shoots at 260 feet (80 meters) in the shade and 200 feet (60 meters) in the sunshine. It seems clear that it is very hard to integrate electronics into pistol models because of a very small internal space. You need to squeeze the speaker, battery, motherboard and a lot of other stuff into a very small body. Some players also want to have an OLED-display. If there is not enough room inside we usually have two ways: either manually expand the space, filing down and making thinner the walls and removing partition walls or design a huge forend, sacrificing with appearance. 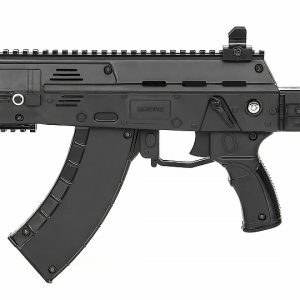 But we are seeking realistic appearance, so we decided not to select any of these options and design new laser tag pistol specifically for laser tag games. So we fit all electronics into taggers body. Gyrfalcon uses lithium battery with 1.4 Ah capacity, which guarantees up to 20 hours of operation. The turning on lock is located on the forend of the pistol, and the charging socket is located at the bottom of the pistol handle. The operation indicator is the OLED display. As in “Predator” and “Phoenix“, we use displays with low power consumption, wide viewing angle and high brightness. OLED-displays work fine at -40F (-40С) degrees, in contrast to other technologies like LCD or TFT. The screen is recessed into the case, so it is not susceptible to shocks from falling to the ground. The speaker is located at the rear of the bolt carrier and is closed by a lattice. Lattices look the same as the corrugations on Glock’s bolt carrier. Little speaker does not reduce the volume of sound effects. 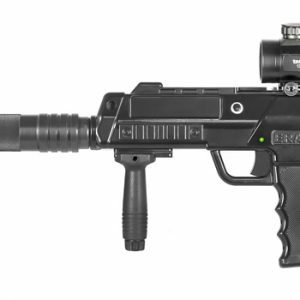 We have also developed a special set of sounds for this laser tag pistol.